The sun has poured its energy onto the earth for billions of years. The radiating warmth from the sun heats water, warms homes, and grows food. Amidst sweltering summer heat, a solar oven or cooker is a fantastic way to prepare a meal without heating up your home. There are myriad solar ovens available for sale; however, solar cookers are easily assembled and can be made from recycled things or old bits and pieces commonly found lying around the house. My homemade solar oven was made from an old copy paper box since it is sturdy, a good size and has a lid; however, any appropriate-sized box will work. First, begin by collecting all of your materials. There are a number of variations on how to make a homemade solar oven and really, it comes down to what you want to use your cooker for and what materials best suit your construction idea. Two cardboard boxes that are deep enough to hold the pot you will use to cook food in. The box that will become the inner box should measure at least 38 cm (15″) by 38 cm. The outside box will need to be bigger than that, with at least 1.5 cm (2/3″) of space between the two boxes all of the way around since this is where you will put the insulation. If your largest box does not have a lid, you will need another piece of cardboard to make a lid. The sheet should be larger than the outer box by four to eight centimetres on each side to allow room to fold over the sheet to make a lid. Black construction paper – The idea of a black surface is to capture the sun’s energy as heat. A lot of instructions on building solar cookers suggest using black paint, but I am a little leery of possible off-gases, so I used black construction paper when I made mine and it seemed to work fine. You will need something to tack everything down. Again, glue seems to be a common theme but I used aluminium foil tape which was easy to use and held everything down nicely. Finally, you will need something transparent to cover the lid.When I assembled mine, I used old school clear transparencies. You can also use oven roasting bags or a glass off-cut, which can usually be obtained for free at a glass shop. Now you are ready to begin construction. Close the large box’s flaps and set the smaller, inner box on top of them. With a pencil, trace around the outer edge of the small box and then cut along the lines you just drew to create a hole. The inner box will need to be at least 2.5 cm (1″) shorter than your outside box. Slit the corners of the inner box to the desired height. Fold each side down forming extended flaps. The next step is to secure the aluminium foil to the inside of both boxes and to the inside of the top flaps of the outside box. Again, some instructions recommend gluing the foil down, I used foil tape. You don’t need to be too neat with the inside of the outer box as it will never be seen. Now, you will need to add the insulation. Loosely crumple up newspaper and place in the large, outer box so that when the inner box is dropped inside, the extended inner box flaps just touch the top of the outer box. Tape (or glue) closed the top flaps of the outer box. Tape (or glue) the inner box flaps onto the top of the outer box. Trim the excess so that it is even with the outer box’s perimeter. Cut a piece of cardboard the same size as the interior base of the inner box. Cover one side with foil and secure with tape. On the other side, cover with black construction paper and secure. Place it into the inner box with the black side facing up; this is what your pots/pans will sit on to cook. You’re almost done. Now you have to construct the lid. There are many options on how to do this depending on the materials you have sourced. If you opted for the piece of glass, this will simply rest over the top of the box. You will need to take care of any sharp edges, so if you are using the solar cooker with children, the glass option may not be the best. To make a lid out of the cardboard sheet, simply lay the sheet over the top of the outer box. Trace around the boxes outer edge and with the razor knife, cut and fold down the edges to form a lip that is about 7.5 centimetres. Fold the flaps down and secure with tape to form the lid. To make the reflector flap that will serve to direct the sunlight into the box, draw a line on the lid forming a rectangle the same size as the oven opening. Cut around three of the sides and fold the flap up. Cover the inside of the flap with foil and secure with tape. To make the prop, bend a 30 centimetre piece of coat hanger into a backwards ‘z’ shape and insert it between the cardboard corrugations of both the flap and the box. Turn the lid upside down and cover the opening where the reflector flap was cut out with either the clear, plastic transparency or the oven roasting bag. If using the bag, make sure that you tape up the ends so that moisture cannot get in between the layers or alternatively, cut it open and use only one layer. Tape it to the box. Your solar cooker is now ready for use! To get the most out of your cooker, put food in dark pots with tight fitting lids (cast iron works wonders). Orient the cooker to capture the most sunlight possible. Depending on what you are cooking and the length of time required, you may need to adjust the cooker and/or reflector multiple times throughout the day in order to keep the sunlight streaming in. The cooker can cook myriad recipes and summer is quickly approaching, so what are you waiting for? 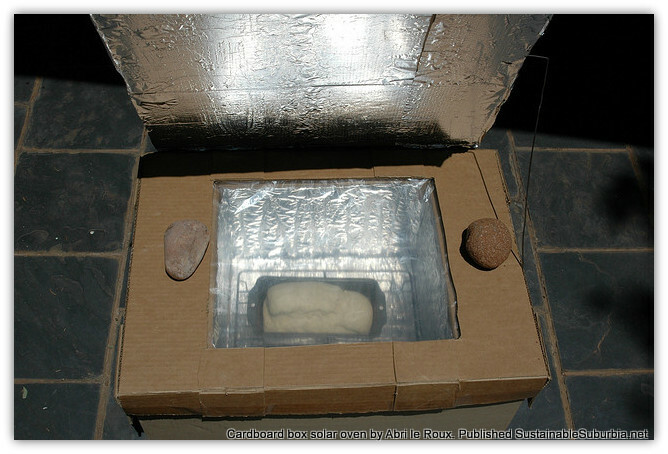 Top photo: Bread baking in a cardboard box oven, by Abri le Roux. This post was entered in the Simply Lives Thursday Blog hop: Consume less, produce more. Hello from TKA! I had co-worker who had a solar oven and took it to a company picnic. The oven worked fine it just took a long time to cook the meat. I think it took about two hours, bu then again, it wasn’t the sunniest day.